WASHINGTON, D.C. -- Congressmen Chris Collins (NY-27) and Bill Pascrell, Jr. (NJ-09) today celebrated President Trump signing H.R. 931, the Firefighter Cancer Registry Act, into law. The legislation they authored together will require the Centers for Disease Control and Prevention (CDC) to develop and maintain a voluntary registry to collect data regarding the incidence of certain cancers in firefighters. This registry will allow researchers to have a greater understanding of the impacts that smoke inhalation and other occupational hazards have on a firefighter's health, and lead to better treatment options. "The brave men and women who selflessly keep our communities safe while fighting fires deserve for us to do everything in our power to also keep them out of harm's way while they are on duty," said Collins. "We currently have a lack of information about how being exposed to certain fires will impact a firefighter's health, and this is a common sense way to collect that data to improve protocols and equipment. I express my deepest gratitude for our nation's firefighters and first responders, and take pride in knowing that this registry could lead to reforms that will save lives." "I'm proud that this legislation has been signed into law. The Firefighter Cancer Registry will bring together information on firefighters' history to help doctors and researchers find any connections between firefighters' work and increased risk for cancer," said Rep. Pascrell, co-chair of the Congressional Fire Services Caucus. "This will improve the safety of the brave men and women who put their lives on the line every single day. This legislation has long enjoyed bipartisan support because all of us want to protect those who protect the rest of us. Thank you Representatives Chris Collins and Frank Pallone, and Senators Bob Menendez and Lisa Murkowski for your efforts getting this bill through Congress and into law. I look forward to working closely with the CDC and members of the firefighting community to see that the new registry is implemented to its fullest use." "Day after day, firefighters all across the country are quick to answer the call of duty. Whether they do so in volunteer service or as a career, they put their communities first on a daily basis without question," said Energy and Commerce Committee Chairman Greg Walden (R-OR) and Health Subcommittee Chairman Michael C. Burgess, M.D. (R-TX). "This commonsense bill will create a national registry to better document the physical toll these everyday heroes undertake and help lead to better treatment options. 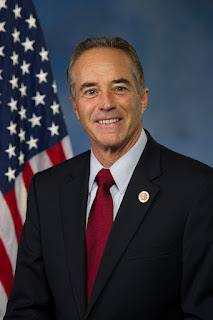 We look forward to seeing this registry come to fruition and applaud Rep. Chris Collins (R-NY) for his leadership on this issue." The Firefighter Cancer Registry Act authorizes $2 million in federal funds to the CDC from FY2018 to FY2022. Data gathered would include a number of potential risk factors, including but not limited to the status of the firefighter (volunteer, paid-on-call, or career), number of years on the job, the number of incidents attended, and the type of incidence. The collection of this data would allow for improved equipment, enhanced safety protocols and preventative techniques for our firefighters. The House of Representatives passed H.R. 931, the Firefighter Cancer Registry Act of 2017, by unanimous consent on June 22, 2018. H.R. 931 first passed the House in September 2017, by voice vote. The Senate passed the bill, with an amendment, in May by unanimous consent. H.R. 931 was signed into law today by President Donald Trump.